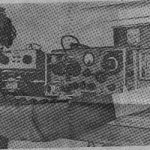 This article on the Bracknell Amateur Radio Club appeared in Bracknell News on 17th. February 1977. You may spot a very youthful G3YMC among other members! Copyright Bracknell News.